TS SBTET RESULTS 2019 for the years I Yr, III, IV, V, VI & VII Semesters, C18, C-16S, C-16, C-14 & ER-91 Schemes held in Oct/Nov 2018, will be declared. And the courses for A/ AA /AEI /C /CCP /CH /CM /CHST /CT/ EC /EE /FW /GT /HS /NMCT /IT /M /MET /MNG /PKG /TT will be released. Results for TS SBTET Diploma 2018 examination have been delayed. The Telangana State Board of Technical Education 2018 results were scheduled earlier for declaration on Jan 31st, 2019. However the results got delayed incessantly for which the reason was unforeseeable. Keep checking this space, for time-to-time regular updates on Telangana SBTET Diploma results. The examinations for polytechnic are conducted two times and are termed as EVEN and ODD semesters. The odd semester consists of 1/4/5 Semesters and rest belongs to Even semesters. TS SBTET results releasing are not only exclusive on Manabadi.co.in website but TS SBTET also declares results on www.schools9.com, www.manabadi.com websites. Candidates of the following years of Diploma 1st year and 3rd, 4th, 5th, 6th semester examinations 2018, who had appeared for the examination in the month of October/November 2018 can get their results from the direct link provided below when results are announced. visit manabadi.co.in or the official website of TS SBTET. 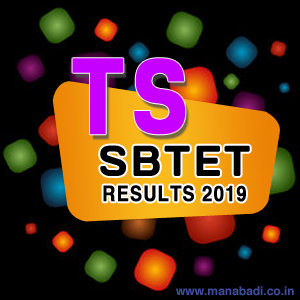 In the official site, click on the link saying TS SBTET Diploma Results 2019 1st 2nd 3rdyear Oct/November. The link will be navigated to a new page. You need to enter your details like roll number and date of birth and submit. On submission, your result will be displayed on the screen. Disclaimer: The details provided here are based on the information we have received. We strongly suggest the aspirants to visit the board website or meet in person to know the fee particulars and as well as the procedure. Recounting (Applicable to all the Theory Subjects including Drawing Subject) - Rs.400/- per subject. Photo copies of Valued Answer Scripts (Photo copies will be issued to all theory subjects including Drawing Subjects) - Rs.700/- per subject. The candidate can make the payment for the above services through Online, The last date for above services is: not yet released. The candidates who applied for Photocopy can apply for Re verification on or before: not yet released. Telangana State Board of Technical Education and Training (TS SBTET) has successfully organized C-16, C-14, C-09 and ER-91 Pharmacy schemes Regular/Backlog examinations in the month of Oct/Nov this year. The exams were held in various centers of the state for which lakhs of aspirants appeared. Now, all the aspirants have been anxiously waiting for the results release of TS SBTET exam. The exam conducting authority has announced that it is going to release the results of SBTET exam in the second week of February 2019. It is expected that the results of TS SBTET exam will be out on second week Release Soon 2019. The authority will issue the result via its official website and www.Manabadi.co.in. Contenders who took the exam can get ready to check their results which will be released anytime soon. They need to provide their particulars in order to fetch the results. TS SBTET diploma result 2018 for Nov/Dec exam will be available soon. Board will disclose the result through its online portal. No other mode will be used for declaration of result. Students can check the result from the Boardâ€™s website or directly from the link provided on this page. As the Board notifies all the students about the results through its official web portal, students must stay in contact with the same for regular updates. The student must keep all the login credential details handy so that they can easily download the result. The final result of the students is prepared on the basis of internal examinations, practical and theory marks. Students are advised not to treat the online result sheet as the original mark sheet. Once the Telangana SBTET result is declared online, Board will issue the original statement of marks or mark sheets and related certificate/diploma to the students. Students can collect their mark sheets and certificates from the respective institutes. Board will notify the students through its website. Students are also given a chance for recounting and for appearing in the supplementary exam after the announcement of result. Interested students have to apply within the stipulated dates. All the students those who are waiting for result are suggested to visit the official portal on a regular basis so that they can get each and every update of the diploma result. When the march-april 2019 results will be announced? Our 2sem exams are also completed, but still we not get our first semester c18 results. Asullu release chastara c18 results. .
Sir inka eppudu release chastharu sir c18 ????????!????!?! When will the results announced??? When this results are going to be ?? Plz soon?? Waiting for results ???????? Because of results... interviews miss avuthunayee?????? 16 to 17th varaku vocheyee laga chudanidi sir ??????????plz?????????????? Sir when u release C16 results Please upload soon sir?? sir, good ofternoon sir, c14 result eppudu relese chestharuu. sir result eppudu vasthayichepandi ...? Sir exactly time and date cheppandi kada sir. Ndhuku sir adukuntaru?? ???????? When is our results sir?? Please let us know wen the results will be d for C18. Sir, please give ur results eagerly.All are waiting fr the results. Sir, please mention the correct date of c16 result. When you will release sbtet c16 results? Many of are eagrely waiting for results?